Improved the workflow in order to handle 30 percent more shirts within the same amount of space. Increased accuracy of shipping correct items by 75 percent. Decreased their touches per items from 11 to four. Created an error free system for shipping and receiving packages into their facility. Restructured their warehouse to double the capacity. Freed up enough additional space to allow for 20% growth. Learned to use lean concepts to reconfigure their space each time they gain access to more area. In 1928, a young married couple in Sweden used the Great Depression as a launching pad to grow a business based on the wife’s success as a seamstress for family and neighbors. The couple took a business managed out of their kitchen and turned it into Eton, a high-end maker of tailored men’s shirts and accessories. The company now sells through 190 retail stores in the U.S alone. Eton’s manufacturing takes place in a Swedish plant, along with two facilities in Eastern Europe. Eton chose Alpharetta, Ga. as their U.S. warehouse and distribution hub to supply both department and independently-run stores with finished products. As the distribution center for the U.S., the Eton Alpharetta warehouse receives and ships out an average of 5,000 shirts per month. For Eton’s department store customers, the team takes the shirts out of the boxes, removing both the packaging the shirts came in and the Eton tags, and adhering new tags that meet the specifications of the stores, including the store name, pricing, article numbers, and bar codes. They then repackage the shirts, boxing them, and shipping them out to distribution centers or specific stores. Many times this entire process happens within 24 to 48 hours of receiving the items from the factory. At other times, the shirts will be stored in the Eton facility until needed. Eton is averaging a year over year growth of 40 percent. But with more than 8,500 items to track in a 5,000 square foot facility, they were having difficulty with the space constraints, managing the inventory, and steps between receiving and shipping. Beth Allen, operations manager, decided that more organization was needed to better support their long-term growth plan. Allen discovered the Georgia Manufacturing Extension Partnership (GaMEP) at Georgia Tech through a contact of hers. After meeting with Bill Nusbaum, Northeast Georgia region manager, and Tara Barrett, project manager, both with the GaMEP, Allen knew she’d receive high value from the services Georgia Tech would provide. Nusbaum and Barrett immediately got to work. They met with Allen and her team, spent time learning about Eton, their inventory, and concerns. They noted that each shirt was touched 11 times in the facility, and found that an employee walked 193 feet when moving the shirt from the first to last step in the process. 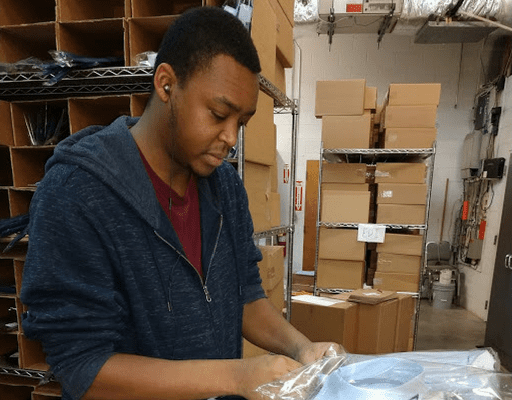 They also discovered that all aspects of the process were occurring in one area, which would get more congested throughout the day as additional people were helping to pack and ship shirts. In addition, Eton employees would have to wait in line to use the work station, as many of the steps occurred within the same workspace. Items were also being placed haphazardly as space became available, causing material to get misplaced. Over the next five days, Nusbaum and Barrett helped Eton transform their space into a usable area that had appropriate flow for the process. Eton only has one shipping/receiving dock door at their facility, so they were putting packages by the door, where outgoing packages were being confused with inbound packages, causing the delivery service to sometimes mistakenly pick up unprocessed deliveries they had dropped off earlier that morning. Nusbaum and Barrett created an inbound and outbound area for the dock door using visual controls. They taped off separate areas on the floor and communicated the changes to the delivery service. These changes have reduced the chances of pickup mistakes to almost zero. Each of the 8,500 items Eton houses has a unique SKU based on combinations of different styles, cuffs, colors, and sizes. Many times these SKUs were just a single digit apart, leaving significant room for error and causing incorrect shirts to get shipped to the stores. Nusbaum, Barrett, and Allen began a color coded labeling system for both the tag the SKU was on and for the color of the SKU’s font. The different combinations provide a visual cue to the person picking and packing the shirts, increasing accuracy in the facility by 75 percent. In addition, the GaMEP team helped Eton reconfigure their warehouse for maximum flow, as well as making their shelving system more user friendly, including labeling rows and individual shelves. An Eton employee adds tickets to shirts. 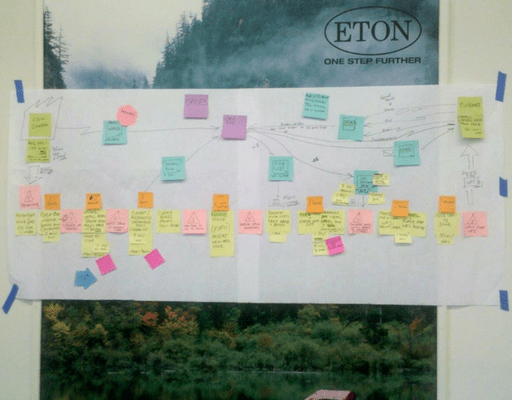 A Value Stream Map helped Eton find opportunities for improvement. Download the Eton Success Story Flyer.